The seat and back is more narrow and seating position more leaned back for optimal comfort. The solid steel rod (steel quality C15K, norm EN10278/ISO 286-2) is Ø0.55”. 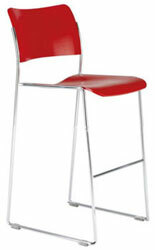 The barstool version is available in veneer, polyamide and upholstery finish. Please Inquire.